Well-timed on the heels of Grant Wahl’s best selling book The Beckham Experiment, Beau Dure’s Long-Range Goals – The Success Story of Major Soccer is the perfect compliment to Wahl’s window into David Beckham’s foray into the world of Major League Soccer over the course of the last several years. 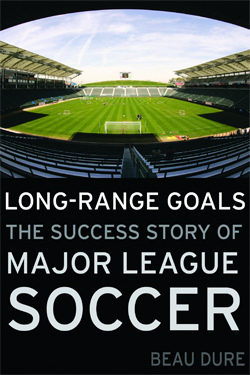 Unlike that book which focussed on a particular story and time within the history of Major League Soccer, Long-Range Goals provides a comprehensive overview of MLS from its point of conception to its current state and firmly places it within the larger history of soccer in North America. A perfect primer for any MLS fan that has only started following the league over the last several years, Long-Range Goals functions as a de facto general history encyclopaedia and provides a fine balance between the matches on the pitch and the unique and evolving business environment in which Major League Soccer has always operated. The general theme of the book is that the league has adapted to the sport’s particular place in the North American market to become a solid business entity that is poised for further growth in its second decade of existence and beyond. The book kicks off with a detailed account of the circumstances in which Major League Soccer was created and goes on to detail the struggles the league went through to find its place in the crowded North American sports market. Long-Range Goals provides a nice overview of each MLS season while also delving into details on the most important events and subjects from the league’s colourful history. One of the most interesting stories is the one surrounding the awarding first division status to a league in the United States. While the MLS was the ultimate victor, it’s fascinating (and scary) to read about the League One America entry, which proposed to significantly alter the sport in order to make it more palatable for an American audience. Many have argued that the main reason Major League Soccer is still in existence today is its relatively unique single-entity structure. Dure also goes into significant depth while detailing the story of the MLS Players’ Association’s anti-trust lawsuit against the league, which in 2002 ruled in favour of the league on all five counts. He also does an excellent job of explaining how canny the league and MLS Commissioner Don Garber were when they made the move to create Soccer United Marketing, which was key to stability, financial viability and success that the league enjoys today. A welcome addition to the small library of significant books on Major League Soccer, Long-Range Goals, the chapter ‘Beckham and Beyond’ ends the story of the league’s first fifteen years with not only Dure’s candid thoughts on where the MLS has come from and where it needs to go. He also provides in-depth commentary from many of the people who have been significantly involved with or covered the MLS since its inception. It is a credit to Dure and the people that he interviewed that very little space is given to sugar coating the league’s history, present and future. The general consensus among most in the book is that the league has achieved a considerable number of the reasonable objectives that the MLS set for itself and that now there is every reason for tempered optimism about the future.